WhatsApp, one of the most popular instant messaging platform is being used by more than 800 million users every month across the world due to incredible security features and easy-to-use user interface. WhatApp is used by millions of people globally in order to use its amazing features that include voice calling, video calling, transfer unlimited images, video and audio messages. It is well-known that WhatsApp was acquired by the social media giant Facebook and since its acquisition pretty much changes were made to this instant messaging platform periodically. WhatsApp has come out with a new update for the Android users that brings a couple of amazing and beneficial features to its app. The latest update of WhatsApp for Android brought amazing features to its app that lets you format the text into bold and italic. This feature will be very helpful when you want to converge on some word and tell your friend something important. In most of the instant messaging platforms and social media platforms, there is no such option of text formatting. 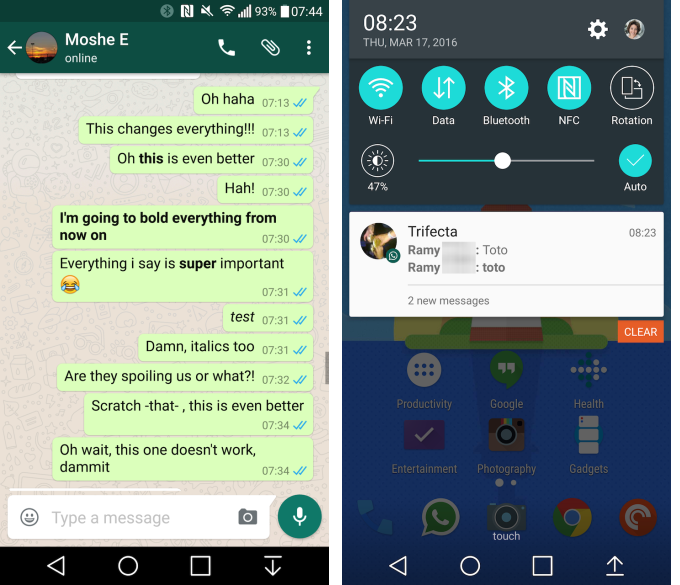 Now, WhatsApp has introduced this new feature that lets you make changes to your text. Here are the new updated features on WhatsApp that brings you much more experience using the instant messaging platform. You can now format text within WhatsApp messages like bold or italics with the new update rolled out on WhatsApp for the Android users. To make a word or a line bold, you’ll just have to put asterisks before and after it. To make it italic, you need to put the underscore before and after it. 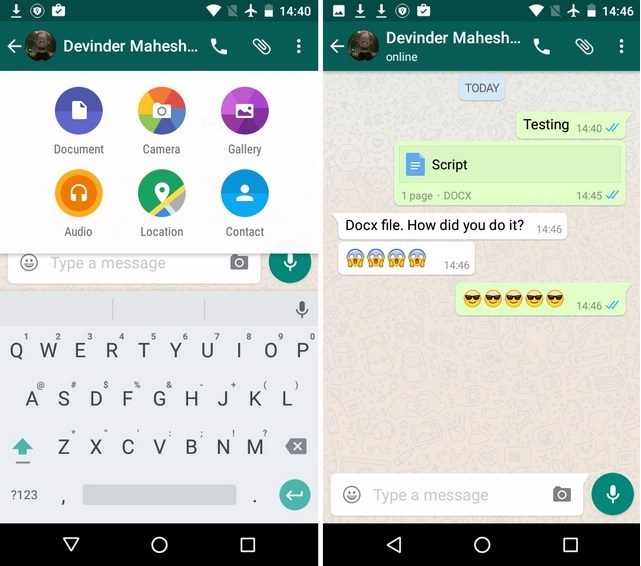 WhatsApp has also included a new feature which would let you send documents directly from the app. The new update of WhatsApp allows you to send documents and files within conversations. The users having the updated version of the app on Android and iOS platforms will be able to see this new feature when they try to send an attachment to their friends via chat. To get the step-by-step procedure to send documents on WhatsApp, check here. You can select a PDF, Word file or PowerPoint presentation file from Google Drive. Despite, all of the files will be automatically converted to PDF format before sending it to other users. 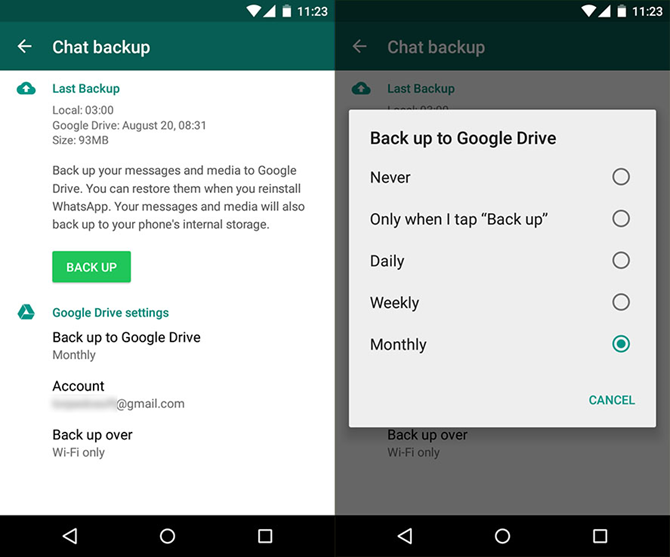 One of the significant improvement made to WhatsApp is the way Google Drive local backups are handled. Earlier, whenever the scheduled backup commenced, you got a pop-up that blocked the whole app, leaving you with nothing but the option to wait until it was over. There would be no progress bar, no percentage, no time remaining. That was quite irritating if you were in the middle of a conversation as the other person would assume you fell asleep or stopped responding. Now the pop-up still blocks everything but it displays progress percentage, which indicates that you have a distinct sense of how much more you’ll have to remain before the app is usable again. Some of these changes might be available on previous versions of WhatsApp, but if you need them all, you need to have WhatsApp version 2.12.535 which you can grab from APK Mirror. Hope the changes made to the WhatsApp instant messaging platform would be very much beneficial for the users thereby enhances the user experience.